I recently read through (meaning skimming parts of it) an interesting book, Patterns of Behavior: Konrad Lorenz, Nico Tinbergen, and the Founding of Ethology (Chicago), by Richard Burkhardt, Jr., about how the study of animal behavior emerged from its former place as a sub-category of natural history to become a full-fledged science in the twentieth century. [Jaensch] concluded that the differences between northern and southern races of chickens paralleled the differences between northern European and southern European races of humans. Northern chickens pecked steadily and accurately while southern chickens pecked rapidly but impulsively and inaccurately. This mirrored, he claimed, the calm, measured, and tenacious behavior of northern, Germanic types as compared with the restless, lively, and flexible behaviors of Mediterranean types. Ethology did begin to improve in the post-National Socialism 1950s. 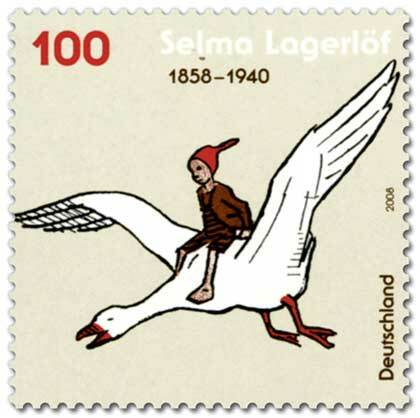 Selma Lagerlof’s classic children’s book The Wonderful Adventures of Nils, which was read to him when he was about six. Nils is the story of a boy who is magically changed into the size of an elf and flies off on the back of a barnyard gander with a flock of wild geese. By Lorenz’s account, the story led him to want to become a wild goose himself or, failing that, at least to have one…. In Lagerlof’s classic, wild geese are identified as clearly superior to their barnyard cousins. Thus, beginning with the bedtime stories of his childhood, Lorenz was taught that wild animals are stronger and more admirable than their domestic relatives are. This idea would feature significantly in his thinking for the rest of his life. Because my daughters must learn of the superiority of the hearty wild Swedish goose to its emasculated domesticated cousin For some reason I felt compelled to get hold of a copy of Nils, which we read to the girls. It’s a pretty great book, although at a certain point it kind of devolves into a Swedish travelogue in which Nils learns about each region of the country as he flies around on the back of his goose friend. It’s an anti-cruelty book, among other things; Nils gets turned into an elf because of his mistreatment of farm animals, and he has to go through his adventures to learn a new comradeship with his feathered and furred friends. There’s a flying goose made of wood with a little figure on it that’s in one of Spencer’s Baby Einstein videos and now I know the referent. Maybe we’ll have to get a copy of Nils. Thanks, Ivan! That northern vs southern chickens stuff is crazy! I also hear that male Swedish dentists are particularly well-regarded. Other scientific fields with disturbing Nazi origins: anti-smoking and dietetics – Robert N. Proctor, The Nazi War on Cancer (Princeton, 1999).